This new Q&A website started in March 2011 after many of our team members observed that whenever we gave lectures, participated in debates, etc. on the topics of Creation, the Creator, Genesis the Bible and Science, or Evolution, the most profitable part often became the final Q&A session. Therefore, we have built a website to do just that, and our team have committed themselves to providing well researched answers. 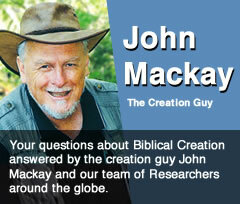 Now you can submit your questions about Biblical Creation any time you like. Click HERE to send a question to a worldwide team whose expertise in their separate areas such as biology, geology, creation, evolution, theology or history etc. ensures you will get a great answer. The web site is coordinated by Creation Research and funded by donations to that organisation. Not all members of the team are part of Creation Research but they are happy to help with this answers website. Final responsibility for any answer rests with the author where signed or with Creation Research if unsigned. Questions received will be allocated for Answers by the website coordinator John Mackay.